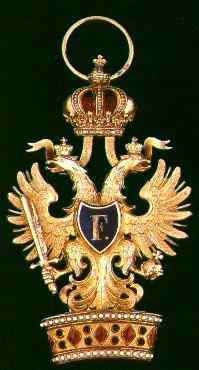 Instituted in 1816 by the Emperor Franz Joseph and it was successor of the Napoleonic Order of the Iron Crown. In first time, this order was intended for the Italian provinces of the Austrian Empire, but latter extended to the whole Empire. Order of the Iron Crown consist in three classes. This order awarded for war merit too, but in that case order had two laurel branches, on the left and right of the eagle. Order of the Iron Crown With Swords have crossed swords between the crown and the eagle's heads for the 1st and 2nd Classes, and on the ribbon of the 3rd Class.